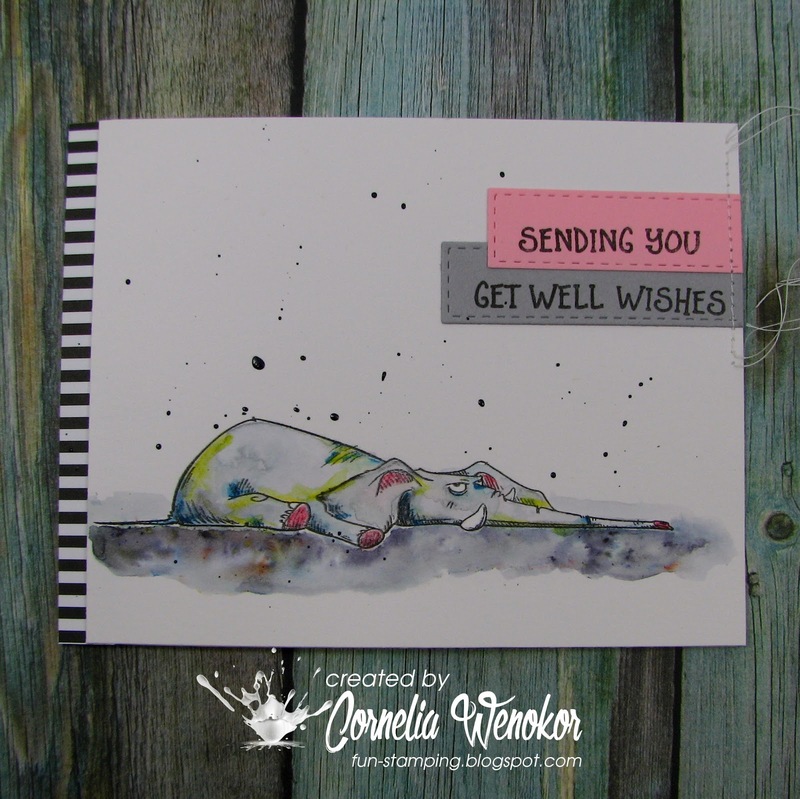 a friend asked me to make a get well card for her - so I grabbed the deflated elephant from Katzelkraft - my go to stamp for that occasion. Its from the set Les Jungles - I copied a picture below. See all those fun critters? I love them all - each one is so expressive! I stamped, water colored and Brusho'ed. Added the sentiment (Honey Bee). 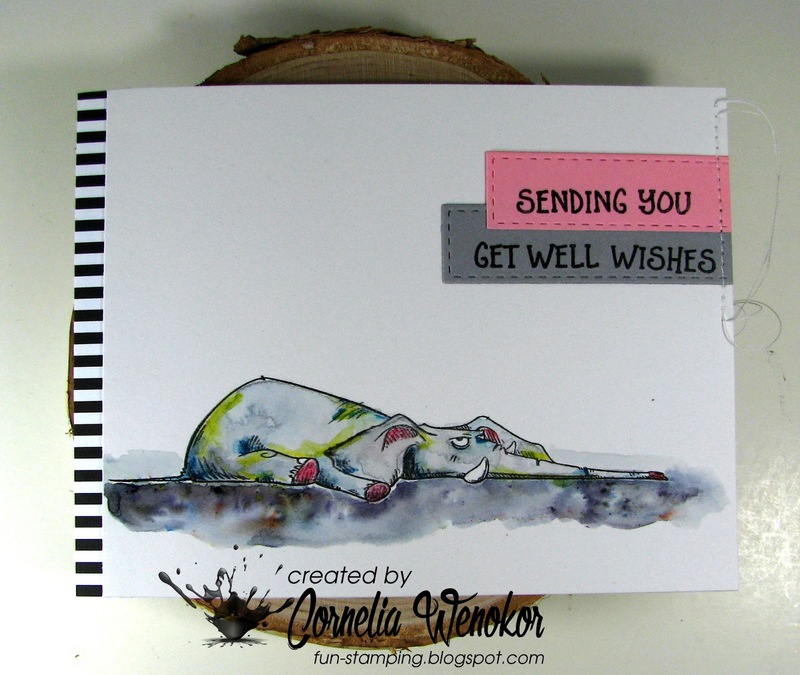 I first did not add splatters (card above), then I changed my mind. I like the splattered version better. Stimmt!!! Die Version mit den Spritzern gefällt mir auch besser, die Karte sieht nicht so leer aus. Der arme Elefant scheint unter eine Dampfwalze gekommen zu sein. Sooooo platt kann man nicht von allein werden, auch nicht, wenn man krank ist. Diese Katzenkraft-Stempel sind einfach nur herrlich. Und du machst so schöne Karten damit, da müsstest du einen Extraorden bekommen. You know this is my favorite elephant, right? And today, it looks like how I feel so it really appeals to me. Perfect for a "feel better" card. 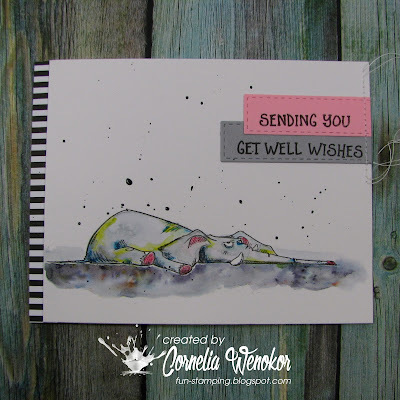 Adorable...what a sweet card, so in love with that fabby elephant! 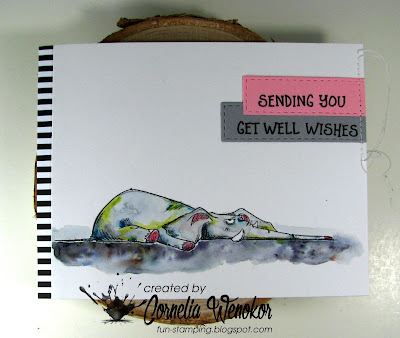 Fun card but that elephant looks pretty well worn out. You do great fun card designs always. They are a joy to see! Oh my goodness, Cornelia, what a darling elephant image--and he looks so out of sorts. Poor thing! Wonderful colouring! I, too, like the splattered version better. It seems perfect for the state the poor elephant is in. Great card! 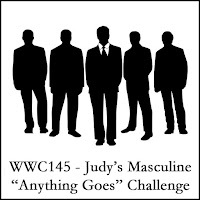 Thanks so much for joining our Watercooler Wednesday Challenge this week. Love that elephant! And your coloring is fantastic!